Trade talks between the U.S. and China resume today (Wednesday). Global growth concerns easing amid a more positive tone from economic data. A weaker dollar lends support to the commodity sector. Planting and logistic concerns continue amid a stormy, cooler weather pattern over the next two weeks. Wheat is leading the charge amongst all grains, up over 1% during the afternoon trading session. An array of news and data including trade optimism, a weaker U.S. dollar, easing global growth concerns, and continued planting and logistic concerns supports the a bullish sentiment in the grain markets. Trade talks between the U.S. and China ended last week in Beijing on a positive note. Talks between the world's two largest economies resume today in Washington D.C. The global stock market got off to a great jump earlier this week after a strong China manufacturing data report. And today, the Caixin services purchasing managers' index rose to a 14-month high further proving that China's economy is bouncing back, adding to continued global rallying. Because of this, investors have been dumping some of the safe-haven assets, such as the dollar. The weaker dollar has given support to the commodities market. 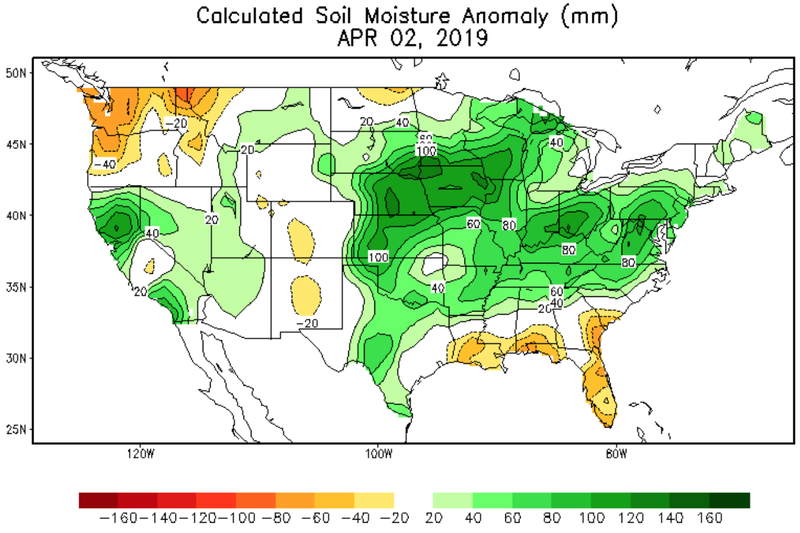 And finally, weather is also in play as the latest set of weather data shows the increased risk of more storm systems and a wetter-than-normal pattern taking shape over a large chunk of the country including the corn and soybean belts. Although, the storm systems over the next couple of weeks will be quick hitters and not deluges, the frequency will cause disruptions to planting and will yield an overall wetter-than-normal pattern in areas that don't need it. Adding to this is the risk for cooler temperatures developing across much of the country centered over the central U.S. during the middle third of April. Outside of the southeastern U.S., the cooler-than-average temperatures will cover much of the country and will be concentrated over the nation's heartland. 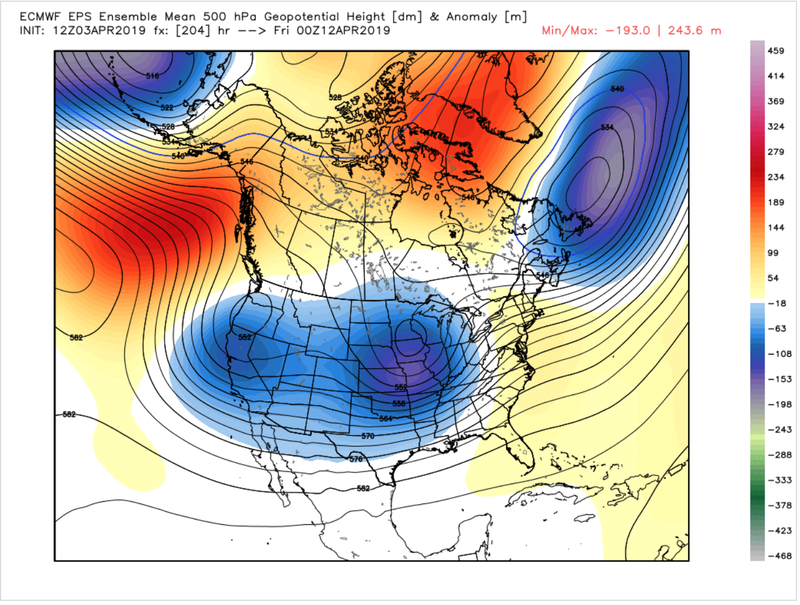 Figure 1 below is a map from the 12z ECMWF EPS model depicting what is looking like a blocking regime developing late next week (~April 11) with higher upper level heights (in orange/red) extending from the northeast Pacific, Gulf of Alaska (GOA), into northern Canada and finally over Greenland, and lower heights (in blue) oriented over the Lower 48. This upper level set-up will translate to warmer-than-normal temperatures across poleward across the high latitudes and cooler than normal temperatures (cool risk) over the Lower 48. This reflects perfectly with the -AO/-NAO/-EPO (negative Arctic Oscillation/North Atlantic Oscillation/East Pacific Oscillation) tele-connection signals in which I discuss in more detail below. The combination of a wetter pattern and cooler temperatures over the next two weeks raises concerns over planting as most days over the next couple of weeks will be considered closed days as opposed to open days for fieldwork due to the disruptions in weather and delays in soil evaporation/field recovery. U.S. wheat May futures contract led the way on Wednesday up 1.59% to $4.7138. 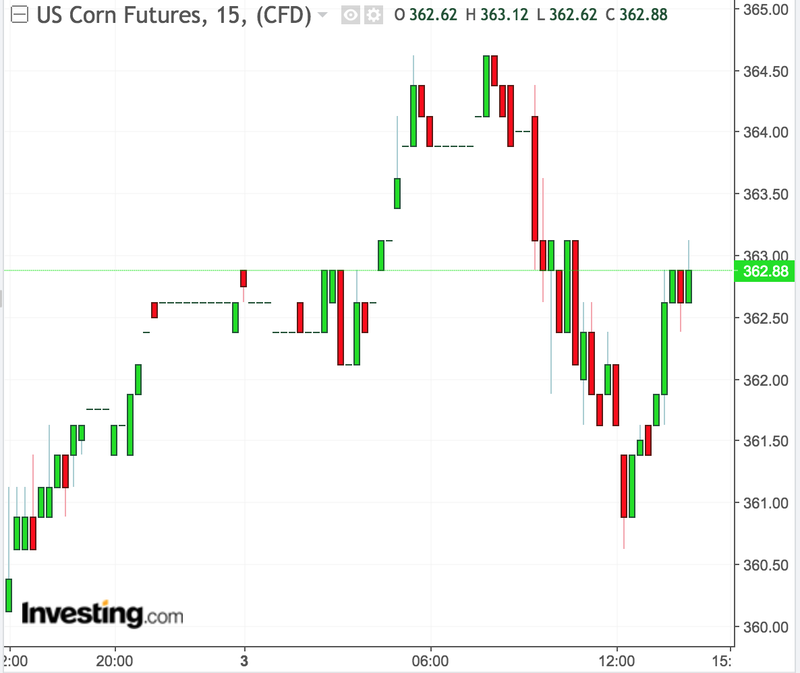 U.S. May corn futures are slightly up this afternoon over 0.24%% to $3.6288, while U.S. May soybean futures were seen slightly down 0.12% to $8.9888. 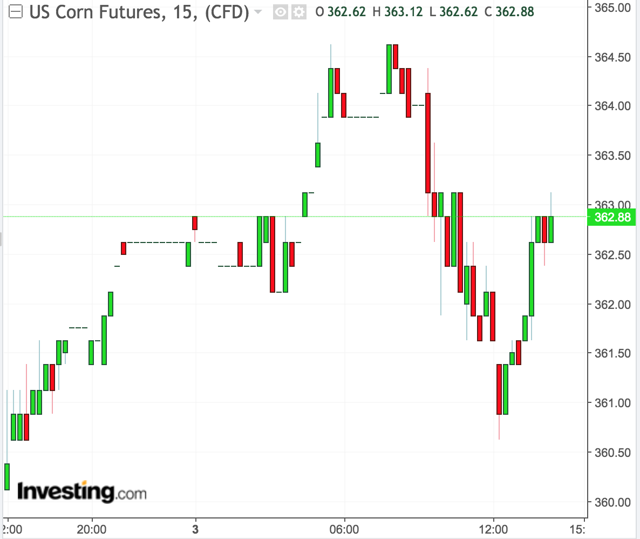 For the less volatile, unleveraged Teucrium ETF grain products, the Teucrium Wheat Fund (WEAT) led the way up 1.12% ($0.06) to $5.40, with the Teucrium Corn ETF (CORN) seen up 0.32% ($0.05) to $15.48, and the Teucrium Soybean Fund (SOYB) down 0.26% ($0.04) to $16.01. 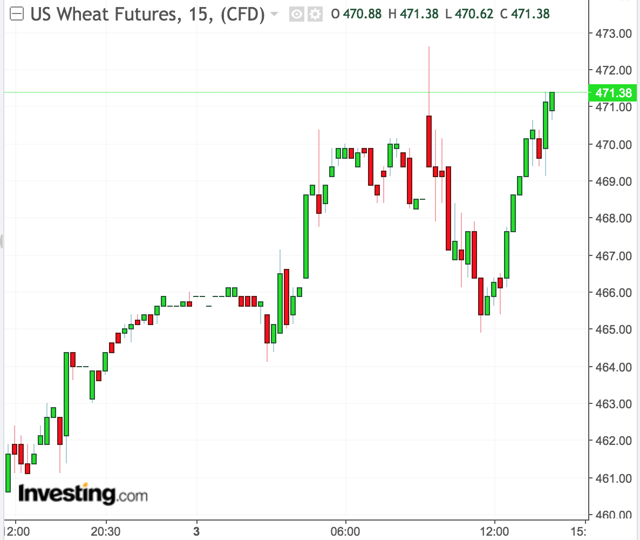 May Chicago Soft Red Winter Wheat (SRW) futures were up during the afternoon trading session 7.2 cents to $4.712, with May Kansas City Hard Red Winter Wheat (HRW) futures settled up 3.6 cents to $4.370, resulting in a 34-cent premium of CBOT wheat to KCBT wheat. MGEX's Hard Red Spring Wheat (HRSW) May contract finished down $0.07 from $5.416 to $5.346. Figure 2 below is a chart illustrating the price trend of the front-month May futures contract for wheat over the past 24 hours. 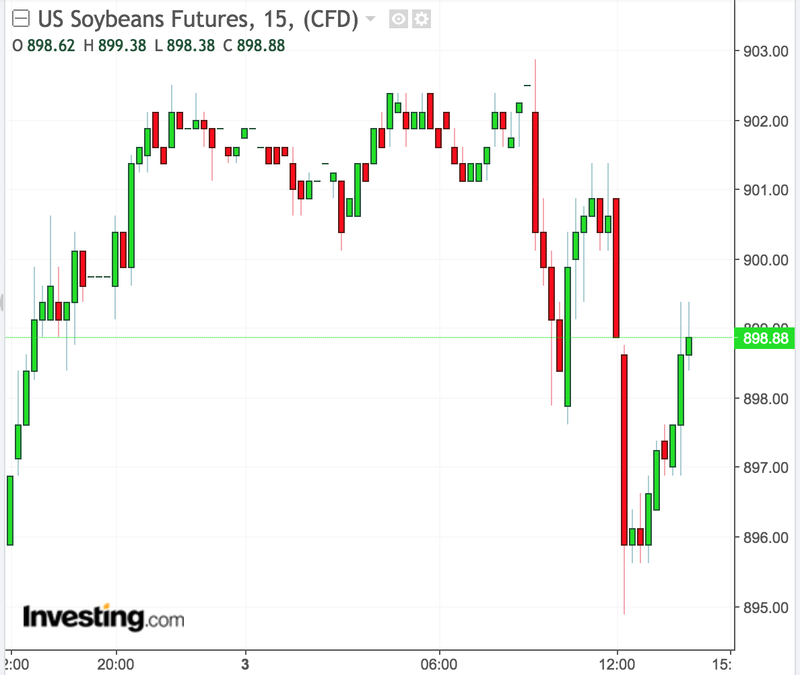 Figure 4 below is a chart illustrating the price trend of the front-month May futures contract for soybeans over the past 24 hours. The weather pattern over the next week will undergo a change that will feature an increase in storm systems and a transition to unseasonably warm weather centered on this weekend with highs in the lower 70s (10-20 degrees above climatology) to a cooler-than-normal weather by the middle of next week. 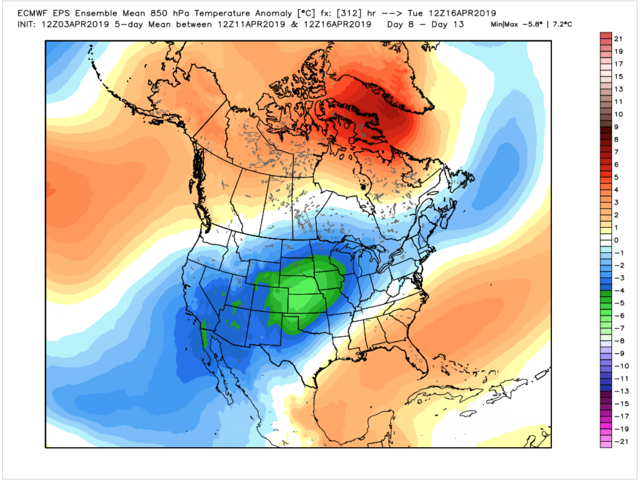 Figure 5 below is an illustration from the 12z ECMWF EPS model depicting cooler-than-normal temperatures encompassing much of the country in the 8-13 day period (April 11-16) with the cold centered across the central U.S. (including winter wheat country and the western corn/soybean belts). This supports the upper level pattern set-up from Figure 1. Figure 6 below are maps from the 12z GEFS of accumulated precipitation anomalies over the Lower 48. To the right is for Day 1-7 and on the right Day 10-16. In green are areas of wetter-than-normal conditions while areas in yellow indicate drier than normal conditions. Wetter-than-normal conditions are expected across the southern U.S. (southern Plains and Delta), and the Midwest/Plains (corn and soybean belts). Figure 7 below is the observed (black line) and a 2-week ensemble forecast of the AO (red lines). 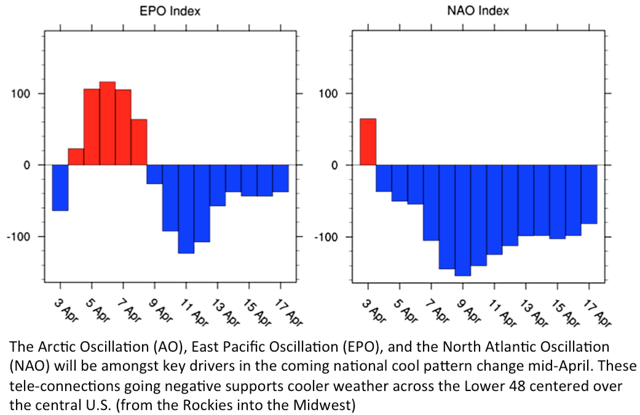 Figure 8 below depicts the EPO and NAO indices that show a transition to a negative phase early to mid April which supports cooler changes to come. Farmers, shippers, and traders are concerned that the above combined with already poor (overly saturated) fieldwork conditions that will continue to disrupt fieldwork preparation and planting as well as logistic issues over the hard-hit Midwest/Plains where river, rail, and road networks will continue to be delayed/disrupted due to ongoing flooding. Figure 9 below is an image showing areas of wetter-than-normal soil conditions (in green) and drier-than-normal conditions (in orange). A large portion of the corn and soybean belt has been super saturated with the highest levels of saturation being across the western corn and soybean belts.